Easy Oven Roasted Potatoes is a side dish that will practically cook itself, and everyone will be scooping up every last bit in the pan? These easy oven roasted potatoes are quick to put together, and then you simply pop them into the oven and you will have a side dish everyone will request again. I would love to tell you this recipe is mine, but this recipe is one that my friend Liz makes, and I believe she got the recipe off of a box of Lipton Onion Soup Mix. Every time she has made these potatoes they are always gone, and we find ourselves fighting over the caramelized bits in the bottom of the pan. These are great for dinner, and even breakfast! You could try some variations on this recipe, you could add some additional fresh sliced onion or even some green bell peppers. You may even want to see what else you have in the crisper drawer in your refrigerator and go from there. I have found you can add a few more potatoes to this recipe and it will turn out well. I personally love these flexible recipes. This one is so simple that if you are a beginner cook this recipe will work out well for you. These are some of the best-tasting potatoes you can make in your oven. Preheat oven to 450 degrees. Cube potatoes into small bite sized pieces, place potatoes into a gallon sized ziplock bag, pour oil over potatoes, and mix well. Add in optional ingredients if you like. Sprinkle in dry onion soup mix, and shake the back so the soup mix coats the potatoes. Place potatoes into a 13 x 9 inch baking dish. Bake for approximately 40 minutes. these are called roasted potatoes. do i use convection roast or bake ?? You can cook them in the oven, either with a standard baking process or convection. Could you use Or’eida frozen potatoes instead of fresh? I don’t see why that wouldn’t work. I would like to subscribe to your website. These potatoes look great. Can you use sweet potatoes instead? I think this would work as well. Sweet potatoes worked well. Boil for approx 30 min, cool, peel, then chop. I added gr pepper .. sauteed with onion and only 1/2 packet of onion soup mix. 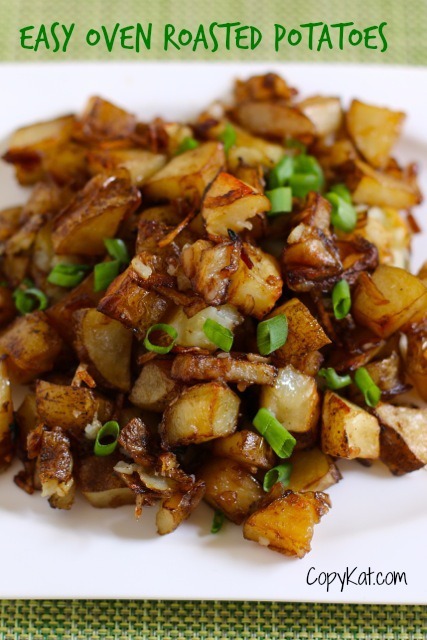 Since potatoes were now softened, only in oven for 30 minutes to allow flavors to meld. Great idea, I will have to give it a try. This is the same recipe that is on the box of the Lipton soup mix, it’s just that other ingredients were used!! Thank you for your comment. It is totally based upon that recipe. Do you add green onion after you bake or before? And how much do you use? I added it after as a garnish, I added about 1 tablespoon of sliced green onions. I love roasted potatoes and I will try this, but with my homemade onion soup mix that costs WAY less. My way, for two people? Two medium potatoes, a teaspoon or two of my mix, plus red and yellow sweet peppers and fresh onions. Can you please share your onion soup (dry) with us ???? Could you please share your recipe for the homemade onion soup mix? Looks delicious. Will try this recipe tonight. I hope you enjoyed the potatoes. These are great with nothing but olive oil, garlic salt and rosemary too.. I didn’t add the onion mix at all..
Wow they are so good. Next time i’ll try the onion mix. I hope you enjoy the potatoes. Oh my gosh, these look SO crisp and gorgeous and I love the fresh green onions on top. Mmmmm. Yum! Love making potatoes in different ways. Thank you for dropping by. I think potatoes can be done in oh so many ways. I do these all the time at home but I love to give them a sprinkling of rosemary and thyme and kosher salt and pepper. Others also use chicken soup mix. Oo the chicken soup mix sounds great. I accidentally unsubscribed from your site. I’m hoping you can reinstate me!! I apologize for any inconvenience! !